Just because food has “organic” on the label doesn’t mean it’s the best you can buy. Our food editor Tracy Carroll tells us why. My daughter is now 13. �When she was a baby I started buying mainly organic food. �After all, we all want to give our children the best we can manage and, to me, organic meant I was assured of fruit that hadn’t been sprayed with a cocktail of chemicals; meat from animals that hadn’t been routinely given steroids; eggs from hens that had not led a miserable life in appalling conditions, suffering broken bones and hock burn. It’s important to mention that organic food and drink is produced to strict standards, often laid down by The Soil Association. �So food is either organic, or it’s not. �You won’t, of course, find a label that states the food is “almost organic”. Take the chicken farmer whose birds roam freely around the farmyard and fields, pecking, foraging and roosting – just how they should. �They build muscle, not fat, and are allowed to mature naturally. Food miles are zero – the hens are slaughtered and prepared right there on the farm and sold from the gate. �Some are supplied to local butchers. This is very good food, but it is not organic food. The story of the chickens is just one example. Over the six years I wrote for the paper, I spoke to so many producers who proudly told me that they adhere to natural, traditional methods. They do it because they know it produces the best results, and because they care. So, I have relaxed my organic rules. As we say at Local Food Surrey, it’s all about traceability. 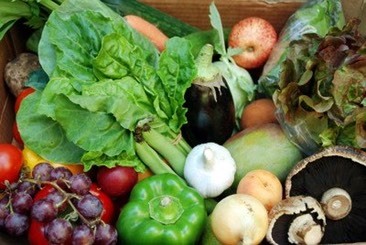 Organic food is often far superior to non-organic, it’s true. However, traditionally-prepared food can tick boxes that organic can’t always manage – low food miles being one of them. Being able to meet the producer is another. I have noticed a bit of a backlash against organic of late; some people have turned against it and become almost aggressive when the “o” word is mentioned. This is a shame. If in doubt, I still opt for organic – particularly if I need to shop at a supermarket because I am distrustful of many of the products on offer and there is no point in trying to engage the assistant in a conversation about provenance (I have actually tried this, particularly with supermarket butchers and fishmongers, but it was pretty unsatisfactory). �But equally, I will happily opt for non-organic if I am satisfied that I am making an informed choice. This is why I prefer to shop at my local butcher, grocer and farm shop. Let’s face it, carefully produced food – whether organic or not – can cost more. However, the mantra is quality over quantity. Buy better, eat less, appreciate it more – and fill up plates and stomachs with low-cost, nutritionally-rich foods such as pulses, home-grown vegetables and wholewheat bread. �Use every last scrap of that local food and make sure your family values it as much as you do. It will taste all the sweeter! •	Learn about the benefits of buying local and what Surrey’s local food scene has to offer with Local FoodSurrey. 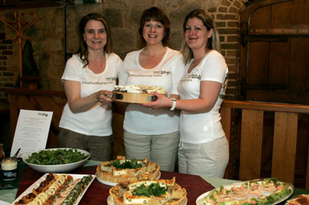 Tracy Carroll�(centre) is a Reigate Mum of one teenage daughter and runs Local Food Surrey, a website all about enabling people to find great food and drink in Surrey. Tracy blogs for us about fantastic local food finds in our area.